Time for another mini tutorial. This one is on fusible web. Fusible web is essentially fabric glue. It has fine strands of cloth or paper embedded in it to hold the glue together in a sheet and a piece of paper on one or both sides of the glue sheet. Pretty much its only purpose is to hold your applique in place while you stitch it down. It is not meant to replace stitching! HOW you stitch it down is the topic for a later tutorial. (1) There are several variables to consider: THICKNESS. Thick sheets have a LOT of glue and work great to hold big things, like patches on the knees of jeans. Most quilt projects don't need thick sheets. Medium or light fusible is great for quilting. If a product has a "Lite" version that will be the best choice for most quilt projects. 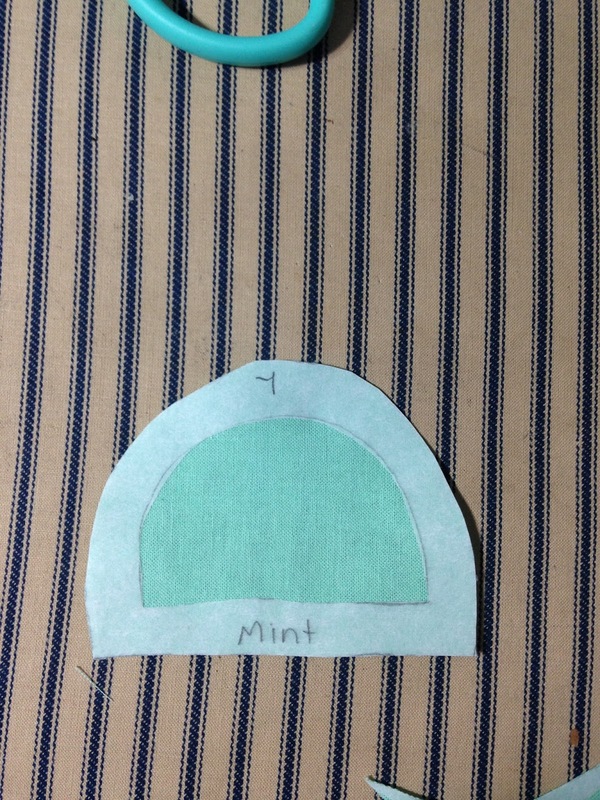 (2) Another variable is the MELTING TEMPERATURE of the glue sheet. Some products require a moderate (wool setting) temperature to melt the glue. Heat N Bond is a brand that requires a moderate heat setting. If you use a HOT iron with Heat N Bond the adhesive properties of the product are gone and you are left with "falling applique".Some products require a hot (cotton setting) temperature to melt the glue. Products like Steam A Seam and Soft Fuse are in this category. Steam A Seam requires a very hot iron and moisture from a steam iron or wet pressing cloth. Soft Fuse (by Shades) and Misty Fuse work best with a dry iron. (3) The third variable is TIME. Some glues are melted more slowly and require the use of a pressing cloth to avoid scorching (burning) your fused applique or background fabric. Slow melting glue will need to be pressed from both side of your piece before a complete bonding has occurred. Some glues bond quickly because they melt fast, and a quick touch of a hot iron is all that is necessary to hold them in place.Here is the bottom line: READ THE DIRECTIONS! I know, you sound just like the hubs who never wants to read the directions and takes twice as long to put stuff together as needed. But all fusible web products are different and you need to know the TIME and TEMP for the product you are using. (4) Yup there is another variable you may not have considered. STICKINESS. Most products don't have it. They don't stick to your fabric or background until they are heated. But Steam A Seam 2 is different. It has a slight sticky surface, like what you would see on a sticky note. It will stick to the applique pieces and the background fabric with a light press of your fingers. It is repositionable which makes it a perfect choice for applique pieces that would otherwise slide around while you positioning them on your block. This is the reason my favorite product for this block of the month is Steam A Seam 2 Lite. All those little applique pieces are a booger and this product keeps them in place until you are ready to fuse them down. It uses a hot iron with steam, which I am already using, and does not add bulk to the applique. My second favorite product is Soft Fuse (available on my website). 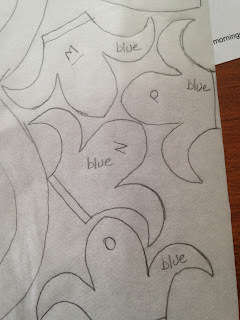 It is NOT sticky, but when I am layering applique this is the product I want. It is so thin that it is perfect when you have 2 or more layers on top of each other. I love the way it feels under my applique. It is a bit expensive, so don't get sticker shock when you go to buy some. Now, a few words about how to use fusible web. Buy a roll or yardage off a bolt of fusible if you can afford it. It will be way cheaper compared to buying it by the sheet. However, if you buy fusible sheets you can run them through your ink jet printer to trace your applique pieces. NO you cannot use a laser printer. I you buy yardage you can cut pages to size for your printer. Load them one page at a time for best results. Make sure you are printing on the PAPER side of the fusible sheet. Let the ink dry before trying to use the printed templates. Don't get it wet. Ask me how I know this. The ink runs and will ruin your fabric. 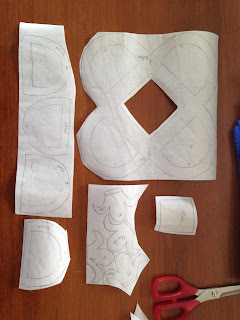 You don't need a light box to trace applique patterns, but if you have one, it is nice. You don't need a fancy expensive one. Home made works just fine. I have a piece of plexiglass I got at the lumber yard glued to 2 cut pieces of 2 x 4 pine. I can set it on my desk and put my Ott Lite under it to make a great improvised lite box. Use blue tape to tape the template page to the lite box. Move the fusible sheet around as needed to make the most of your fusible sheet. Save the big leftover chunks in a zip bag for those times when you lose a piece and need to retrace it. Trace in pencil, not ink. And work from left to right on the sheet if you are right handed. If you are left handed, work right to left so you don't drag your drawing hand in the pencil lead you just deposited on the fusible backing paper. Keep an eraser handy for those lines that need redrawn. Don't use a heavy hand when tracing. A light line is all you need. LABEL each piece after you have traced it. Trust me on this. You will NOT remember where each piece goes after you have cut them out. Label each piece with letter or number from the template page and the fabric color. Leave space between each tracing. 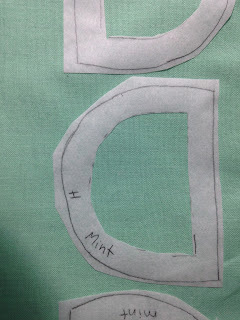 You need to cut out your traced applique templates AROUND the traced line, NOT ON the traced line. Windowing is a technique where you cut the middle out of the fusible web of large pieces and leave about 1/4" of fusible around the outer edges of the shape. Do this to keep your fabric soft and flexible. 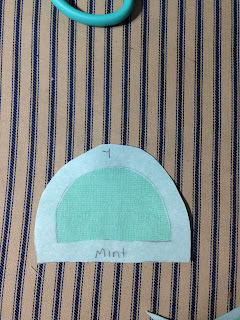 Once they are cut out, sort the pieces into zip top bags by fabric color. This way you can fuse all traced web pieces of one color at the same time. Position all the Color A templates on the BACK of the Color A fabric and fuse them down. Leave a little room between each template so you have room to get your scissors in there without damaging nearby pieces. Sort the cut pieces into new bags by flower or motif, so all the parts for flower A are all in the same bag. Ok, that's enough for now. Next time I will show you how to use an applique placement guide to perfectly position your applique on the background fabric.